Lately I have seen a ton of negativity online in unusual places. I don't really get it either. First of all I have seen people arguing with each other amongst blogs. Now, we all have our own opinions and really unless it's a debate type of blog or political I do not see the benefit in arguing with someone on their blog. You know what I do when I see it? I close it out...and move on. I don't want to see it. I don't need to see. I think it's so sad. I realize everyone is different. Not everyone will be just like you. We need to just accept that and you know, even if you feel really strongly about it the blog is not the place to start making your point. Not on THEIR blog. I don't believe in singling someone out either. Onto my second observation. I am part of a group called Freecycle. I have for a long time though I really rarely use it. I think I did one time. It's been about 5 years. I stay a member of it just in case. If you are not sure what it is, look it up. It's a great program where you basically post wanted items and you post offers to get rid of items. Absolutely NO cost. It's against the rules. It is to keep things out of landfills. It's really a great idea. I have seen some awesome things go through those sites. Baby clothes to Jacuzzis! The jacuzzi was a probably once in a lifetime thing so don't get your hopes up. haha Anyway it is like a message board but off topic conversation is strictly prohibited. You are to only ask or offer that is IT. For some reason the moderator must be taking a vacation because a fight has broken out! Someone declared that another person didn't *need* what she asked for. So now they are arguing. Almost every post. I am so confused by this. I would never feel the need to post whether or not someone needed something and honestly who cares? I don't care if you need it or not. It doesn't affect me at all. Am I alone on this? What is with the online negativity? One big question I think I always have on my mind and I am sure any cancer survivor does is what should I expect now? I realized the fear is worse actually once you are declared "in remission". I hate to say it but it's true. The reason? Well I am not technically cured until I reach the 5 year mark. I don't see the doctor every 2 weeks anymore. I am not surrounded by people trying to fix me anymore. To top it all off during my illness I was also pregnant so I had my regular OB and a high risk OB. I was pretty much always having a doctor's appointment. After it was all done it was quiet. There weren't any doctors. There was no one trying to make me better. It was done. So, it's easy for paranoid thoughts to creep in on occasion. I have always suffered from a bit of neck tension. On days when it's bad it feels similiar to the pressure I used to get so momentarily I turn neurotic and get scared. Then it goes away. The other pressure did not ever go away. I realize I am being obsessive and stop. The point is I still know that it's normal to feel this way. You can't live your life worrying about tomorrow or what the next day might bring. You really must focus on today and getting through each day as best as you can. And I have definitely realized that worrying about what has not happened and may never happen is a waste of life and your time. Enjoy what you have now...today. Don't waste it. It's too precious. Remember each day is new. There are no mistakes in it yet. It's fresh. So make the most of it. You know, after you go through something like this you see everything in a different light. I mean everything. First it was my first Thanksgiving in remission and now Christmas is upon us. It's so hard this year financially for everyone I know. I even just realized that we have a salt shortage this year for the icy roads. I hear the sirens go off several times a day from the fire department and I know it's an accident. I just know it. I realized last night while making a trip to get Gabriella some formula that the roads had been plowed but no salt at all. This makes a huge difference. You slide and slip. It's scary and I guarantee I won't be driving on it much. Normally around here they are salting the roads just at the storm warning. I usually feel fairly safe. Last night it was blowing and drifting right into the roads. We made it home safe. That's what matters! I have another miraculous story about Gabbi's life that I am not sure I've filled anyone in on. I think about it sometimes. For all the bad things I remember that I must have a guardian angel just sitting on my shoulder waiting to protect us. The day I checked out of the hospital we were so excited. I put Gabbi in her cute little teddy bear snowsuit and got her all ready to go. I got wheeled out and we were on our way. We had our little one in the vehicle and we were on our way home. It was a good drive because at the time we lived 2 hours away. I had been taken by Life Flight to that hospital. Anyway we were driving down the busy 4 lanes and my husband decided we need to stop at ATM and get money so he slowed down to make a right hand turn. As he did this the car at that turn pulled out right in front of us. If we hadn't of slowed down we'd have slammed into him. The SUV behind us didn't like us slowing down I suppose so started to slam the gas and pass us on the left, which they do have the right to do except that he slammed into the car that pulled out in front of us. There was a truck also in the far lane waiting to turn to go into the same place as us. He was just sitting there waiting but when the SUV hit the car, the car flew right into the truck. It was a 3 car pileup literally feet from my window where I was sitting by Gabbi. I saw car chunks flying up in the air. It was a serious shock and we called 911. I hoped everyone was OK. Seriously...what are the chances? I need to give my guardian angel a raise. I really do call her that. She's my miracle girl. I worry about naming her Gabriella. Why you say? Well I love the name and chose it because I wanted a strong name. I wanted something that meant something. It took so much strength and faith to get through my pregnancy and the fear of the cancer. I chose it because it means "Strong by Faith in God". Now you can look it up on different sites and different baby books and they'll all really give you different definitions but all basically the same idea. I felt it was sooooooo perfect. Then came High School Musical. You can't possibly be alive and NOT know what that is. Maybe it's just me with a house full of little girls. The main girl's name is Gabriella. Now, I realize it is not an uncommon name but now I am fearing that by the time MY Gabbi is in grade school there will be no less than 5 of them per class. ha! Anyway, that is something I have been thinking about. I think the only possible thing that could be worse is if someone thought I chose that name because of that movie. I admit the singing is not bad and it's not bad for kids to watch but it's not exactly my Friday night pick. She is getting so big by the way. She's not walking quite yet. I think she will be before too long though. She really talks a lot and screams in the highest pitch you've ever heard. It's a little hard on the ears but I love every minute. She thinks it's pretty hilarious actually. Her favorite show is still Yo Gabba Gabba. I have seen it a bit more now and honestly though it's very odd it does teach her things. It shows them all sorts of good morals and teaches her about all kinds of things. I don't mind the occasional tv show. It helps too when I have no choice but to cook dinner or help one of her sisters with their homework. I got a pretty big award and I am excited about it. 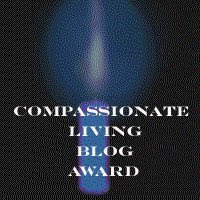 I put my name in and I was selected as the winner at this site: http://compassionatelivinglinkslist.blogspot.com/. Please stop over and visit. I am going to have a spot over there once I get my ad to her. I hope you'll all take a look. I hope I'm back for good now even though I have the laptop issues and for some reason the entrecard problems. I have no idea what to do about it. I can only say I'll be here as much as possible and drop as much as I can as well. 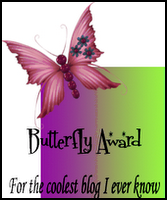 Here is my award! Well, my bad week wasn't quite over. Things have been really hard lately. My laptop broke to top it all off. Well, my daughter accidently knocked it on the floor and where you plug it in, to charge it up, well that knob just fell right out so I can't plug it in anymore. Ugh. I tell you what I am so frustrated but this too shall pass as they say. I wanted to get right back on then that. I need to get it fixed and I have no idea what something like that costs. I said I loved blogging because even though I haven't been on here today I had so many encouraging comments. I never really let myself get too down. I am a pretty optimistic person but when things continually seem to just go wrong it's hard to keep your chin up. I can do it though with the wonderful support system I have always had. Someone said they hadn't noticed my lack in posting. That's so funny because I had slowed down but I guess since I usually write about 2 or 3 a day, one a day seemed like nothing. I'll try to get all my drops in tomorrow and I'm going to do some now. I hope everyone has a great evening! !